This multi-functional form of training make them suitable for all ages. Various exercises can be performed by standing, sitting and lying. • Can be used alone or with other exercise equipment such as exercise bands, tubing, weight and balls. 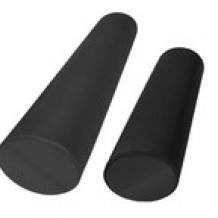 EVA Foam – EVA is popularly known as expanded rubber or foam rubber. It’s resilience helps it maintain its shape for a very long time. EVA foam is also heat resistant, water proof and highly durable.